WHAT WILL THE CAMP PROVIDE? WHAT MUST CAMPERS BRING TO CAMP? We ask campers to bring clothes for the entire session. If it rains heavily, we’ll dry clothing as needed. Much of the day will be spent in a T-shirt, shorts and/or a bathing suit. Everything should be packed into a soft travel bag or backpack and a daypack that campers can carry by themselves. All items must be clearly marked with the camper’s name. The numbers include what the camper will be wearing while traveling to camp. See ( ) if different for mini-camp. sweatshirt - 1 toothbrush, comb or brush, etc. small day pack for bus ride to camp, day trips to beach, hiking, etc. Our Policy - Our campers do not need cell phones, electronic games, music devices, or food from home during camp. Campers will be busy enough without all that stuff. If electronic gadgets are brought to camp for use on the bus, we’ll collect them once at camp (except cameras) and all food and they will be held until the end of camp. Thank you for your understanding and support. Don’t hesitate to call for clarification or with any questions you might have. WHAT WILL MY SON/DAUGHTER BE DOING AT CAMP? Through observation, exploration, sketching, journal writing and more, we’ll explore the world around us. 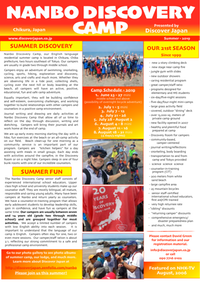 Ocean play (swimming, boogie boarding, snorkeling), hiking, crafts, campfires, group games cooking, frisbee, bicycling and more, all the while having fun! There will also be activities to strengthen language skills, science awareness, and personal growth and development. WHY DO WE NEED TO BRING A HAT? Our campers and staff will always wear a hat while outside during the day. The sun is very strong during the summer and we want to protect our valuable heads. Safety, safety, health! WHAT TYPE OF MASK, SNORKEL AND WATER SHOES DO WE NEED? An inexpensive mask made of silicon with tempered glass. This is optional and will be used more from late July through August. Footwear is needed for tide pool exploration. Croc type shoes, with a back strap, are excellent. Flipflops are not good for walking in the water. WHAT TYPE OF SWIMMING SHIRT DO WE NEED? All campers and staff will always wear a shirt while at the beach and in the water. An inexpensive, quick drying rash guard or aqua shirt is best. They are available at Daiei, Uniqlo, Land’s End, Mont-Bell in Shibuya, etc. Health, safety, safety! T-shirts are too heavy and take too long to dry. SHOULD I TELEPHONE MY DAUGHTER/SON? WHAT ABOUT SPENDING MONEY? We don’t encourage telephone calls except in special situations. If you do call, please call between 7:30am and 8:30am or between 8:00pm and 9:00pm. Please use my mobile number for all calls (090 7716 0102). There will not be anything that our campers will need money for, other than perhaps a drink for the bus ride to and from camp. WILL WE HAVE ENOUGH FOOD TO EAT? Unless you are a very, very picky eater, you will have plenty of good food. We always think about good health and nutrition when choosing our menu. We will also think about the big appetites of active campers who will spend most of every day outside. The campers will help to prepare and serve each meal in small “meal” groups. WHERE WILL THE CAMPERS BE SLEEPING and NUMBERS? The campers will sleep on bunkbeds in one of four bunkrooms. There will usually be a counselor sleeping in the room with the campers. We expect to have between 10 and 26 campers in each session. We strive to have a very positive camper/counselor ratio. IS IT OK TO SEND BAGS BY TAKYUBIN DELIVERY SERVICE? Yes, if you would like to send a bag or pack with clothing, please make sure that it arrives at camp at least a day before camp begins. Use Yamato (Black Cat) shipping company and clearly label the pack with your son/daughter’s name. Please send bags round trip (ofuku) from the start. Address the pack to the address above in care of D. Green. Your son/daughter should carry a small day-pack and water bottle on the bus from Tokyo Station to camp. If you have other questions, please call or e-mail!